“Do you drink too much all the time? You’re lying relaxed on your sofa on a Saturday night and you don’t have the energy to do something useful? Well, that will certainly not change after watching this romantic comedy which takes place in the vicinity of Hampstead Heath. The whole film proceeds at a leisurely pace and tells about the strange relationship between Emily (Diane Keaton) and Donald (Brendan Gleeson). Emily is a middle-aged widow living in a respectable appartment opposite Hampstead park. Donald is a wayward tramp living in a little self-build shack in that same park, growing his own potatoes and carrots and fishing for lunch in the local pond. The two relate to eachother as yin and yang. Emily is having money troubles after the death of her husband, who left her a mountain of debt. She works voluntarily in an Oxfam clothing store and is reasonably socially engaged. Donald, on the other hand, never worries about money and wants everyone to leave him alone. In his eyes, the rest of the community consists of money-minded egocentric know-it-alls who do not understand and appreciate his wilful lifestyle. The bare belly of bathing Donald. The advantage of films such as “Hampstead“, is that you won’t be flabbergasted by it. You get a warm and blissful feeling from it and your brain cells are spared an exhausting effort. My philosophizing about “being amazed while watching a movie” (read my review about “Paddington 2” once again) isn’t applicable to this film, because there’s really nothing to be surprised about. The choice of its title is quite obvious. And when Emily looks unconsciously with binoculars through the attic window and thus discovers the bare belly of a bathing Donald, you immediately know what the tree-hugging activist is planning to do. What follows is a succession of endearing conversations and predictable misunderstandings. Fortunately, it doesn’t lapse into romantic excesses and we are simply witnessing a burgeoning friendship between two individuals who have their own personal problems. One person fails to make ends meet financially and her gossiping high-society neighbor tries to link her to an accountant. The other is urged to leave his premises or he’ll be expecting some legal proceedings. Well, it’s clear from the beginning how this will resolve itself. I really enjoy the acting of Diane Keaton. In every film she’s the personification of a very cozy, hugely affectionate and huggable elderly lady. Such a granny who looks immensely friendly, helpful and old-fashioned. And on that level, she’s of course the correct choice to play the character Emily in this not so surprising film. Because to be honest, it seems as if Diane Keaton always plays the same movie character. I’m sure Diane Keaton is a similar person in real life and thus plays herself all the time. Brendan Gleeson, on the other hand, was a joy to watch. A bearded garden gnome who’s sometimes a real old grumbler but next shows he also owns a caring heart. Even though they look like an odd couple and it feels as if they don’t really belong together, I can understand that someone like Emily can succumb to the sometimes hidden charms of Donald. It’s not wasted time when watching this romcom. Apparently the story is based on true facts but some things are a bit romanticized and made up. The whole thing reminded me of “5 Flights up” where Diane Keaton also had a real estate problem together with Morgan Freeman. 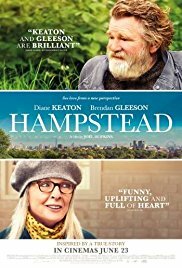 “Hampstead” is like some household tasks. You do not necessarily have to do them, but if you can bring yourself to carry them out, it won’t hurt either. So it’s not required to watch this average, easy-going romantic comedy. But if you do, it won’t seem as if you’ve ruined your precious time.